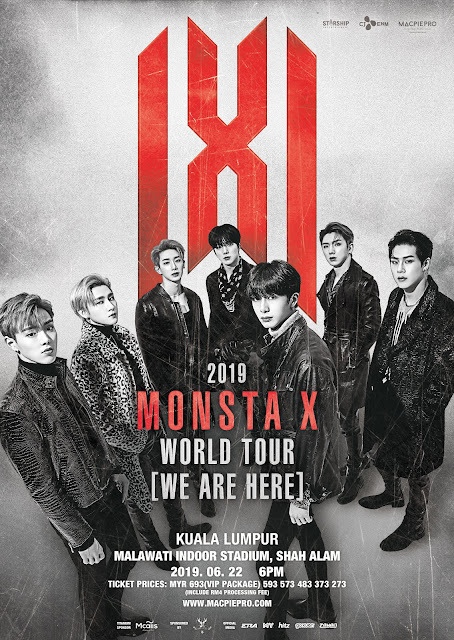 GOKPOP | Exclusive K-News in Malaysia & Singapore: Meet MONSTA X Up Close: Hi-Touch & Send Off Pass @ 2019 Monsta X World Tour 'We Are Here' in KL! 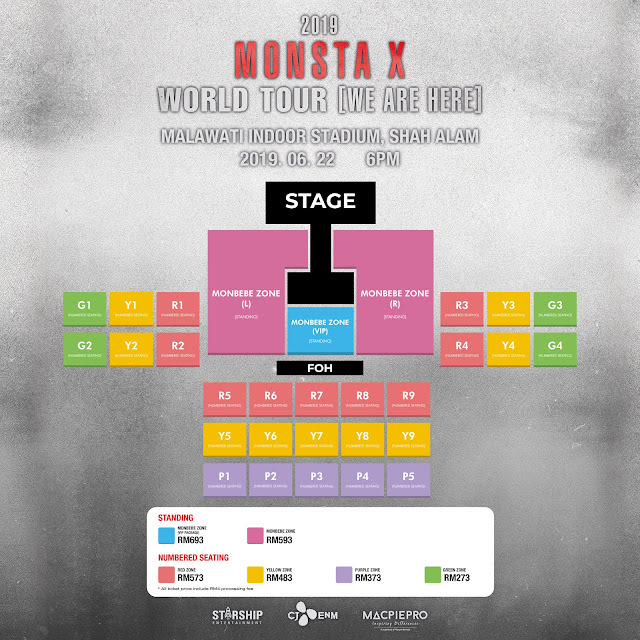 Meet MONSTA X Up Close: Hi-Touch & Send Off Pass @ 2019 Monsta X World Tour 'We Are Here' in KL! MONSTA X is coming back to meet Malaysian MONBEBE on 22 June for for their world tour titled 'We Are Here' in Kuala Lumpur, you can be sure it'd be show-stopping. Following the success of various K-POP concerts, MONSTA X will take the stage as the second K-Pop group this year under the MacpiePro’s Crazy 20 plan to imbue Malaysian fans with their high-octane live performance energy. Presented by MacpiePro, MONSTA X 2019 World Tour 'WE Are Here' in KL is set to take place at Malawati Indoor Stadium on 22 June. Offline tickets will be on sale for 2 days on 20 and 21 April at Mcalls Digital Lifestyle store (DLS), online tickets however, will be on sale from 22 April onwards via MacpiePro official website. 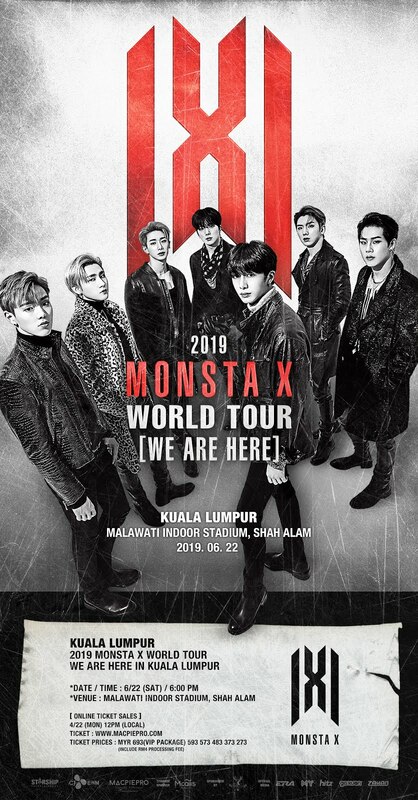 This world tour marks MONSTA X 2nd visit to Malaysia as previously they came here for K-WAVE 3 Music Festival held back in August 2018. With MacpiePro’s corporate mission for Music Fans to embrace a ‘STRESS-FREE MUSIC’ spirit, MacpiePro is once again collaborating with Mcalls to provide the ‘HITS’ surprise for Music Fans. Music Fans will enjoy up to 30% off from the ticket prices when they subscribe to Mcalls HITS Plan. Get the first 2 tickets of 2019 MONSTA X World Tour 'We Are Here' in KL concert tickets at 30% off and an additional 2 tickets at 10% off (*only eligible for Red Zone RM573 or MONBEBE Zone RM593). Existing Mcalls Fans can also upgrade their existing plan to HITS Plan to enjoy this HITS Deal. This HITS Deal are available to purchase from 13 April to 19 April starting at 10AM via Mcalls Digital Lifestyle Store or Mcalls official website.